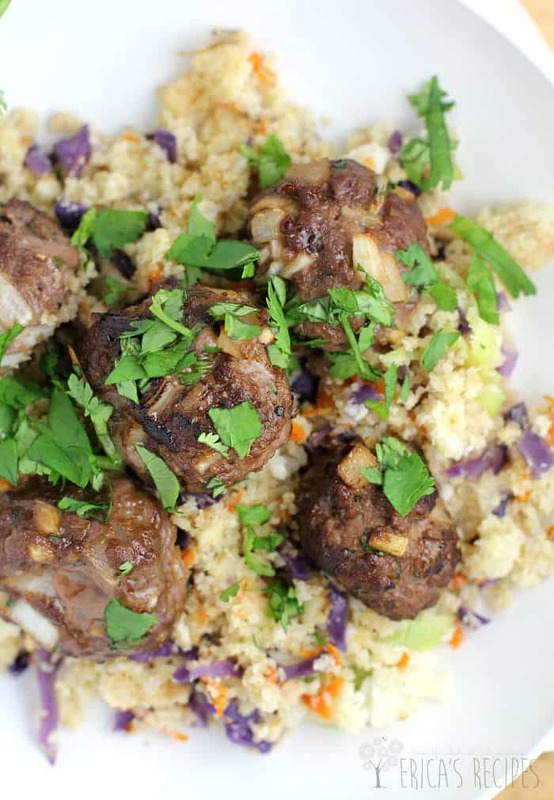 This Asian Meatballs recipe is brought to you by just a couple pantry staples and the uber-hip and surprisingly versatile cauliflower for an easy, HEALTHY dinner your whole family will love. Well if you know me, or know this site anyway, you know I am all about quick, easy, healthy, tasty, sneak-in-the-veggies-cuz-I’m-not-good-about-eating-them kinda meals. And if you have followed my recent family diet overhaul, then you know exactly where this meal is coming from. 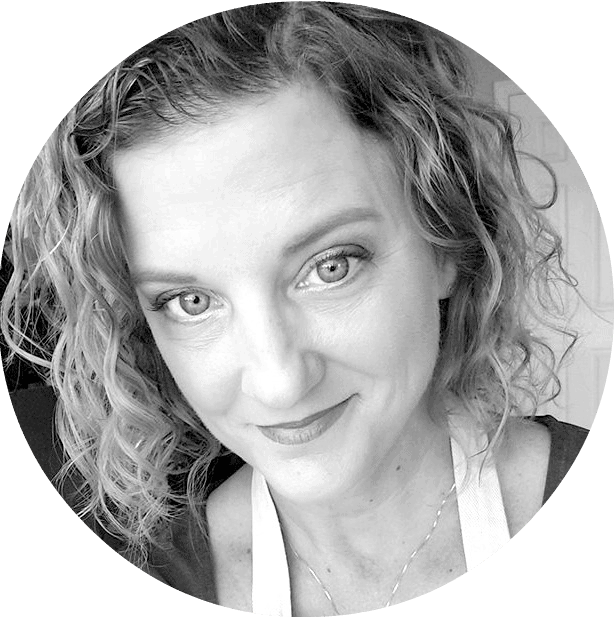 So, now that Labor Day has passed and school is back in full swing for pretty much all of us, I thought now was a good time to give you a new little weeknight option. So, cauliflower is all the rage and has been for a while. Just check out Pinterest and you will see it a thousand different ways. I have done the cauliflower-as-pizza-crust thing …meh. I have done the cauliflower-as-alfredo thing. …umm, no. …but this was the first time I have tried it as a replacement for rice. And happiness! Cauliflower as “rice” totally works. Not as a copycat or knock-off. But as its own tasty, healthy, I-can-eat-as-much-as-I-want, quick and easy side dish. My world is changed forever. And the meatballs!! Holy hell are these so good! The entire family – even the 4 year old – ate them up yum. I have been cooking so much seafood and chicken lately, that I just wanted a hit of beef one night, and by using lean beef, these saucy balls are kept light and healthy. Using 93% lean beef, this entire dinner comes in at 281 calories. That’s it. With loads of protein, vitamin A, vitamin C, fiber, and iron. Healthy healthy healthy. So here is the new one folks. Hope you give it a shot and lemme know how you like it! Weeknight dinner, we got this. Asian Meatballs over Cauliflower Fried "Rice"
For the Cauliflower Fried "Rice"
1 head cauliflower cut into florets. In a large bowl, combine the ingredients for the meatballs. Form into ~2 dozen (1-1/2 inch) balls. Heat a large, cast iron skillet over medium-high heat. Working in batches, add meatballs and brown, turning gently, on all sides. Transfer to a rimmed bake sheet sprayed with cooking spray. Bake the meatballs 5-7 minutes or until cooked through. While the meatballs are cooking, prepare the cauliflower rice: add half the cauliflower florets to a food processer and pulse a few times to make the "rice". Repeat with the rest of the cauliflower. Heat the olive oil in a large, nonstick skillet over high heat. Add the cauliflower rice, green onion, carrot, and red cabbage, and give it a quick saute to cook the veggies to al dente (you don't want them soft). Season to taste with kosher salt and fresh cracked pepper. Toss in the cilantro. Serve immediately topped with meatballs (5 or 6 per person). Yields: 4 servings. This sounds so good and looks great too!!! I’m loving these flavors and that you “fried” the cauliflower rice!!! Genuis! This looks delicious, Erica…I think my family would love it! Pinning! 30 seconds ago I was just saying that I love when Asian flavors pop up in unexpected places. These meatballs are a great example. I could down a dozen or so of these, no problem. I’m with you, Erica! Cauliflower rice is a great alternative! So many wonderful flavors in this dish. Thanks for sharing! Looks so healthy and really yummy, Erica! Such a delicious and healthy meal option! Love it! Gorgeous photos too! This looks great! Now, if only I could get my husband to eat cauliflower! 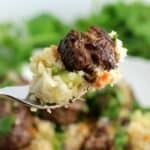 This is a great low carb dish and I think I would prefer it with the cauliflower over anything else. Great recipe. This is just a fabulous healthy meal. Very impressively done, Erica! 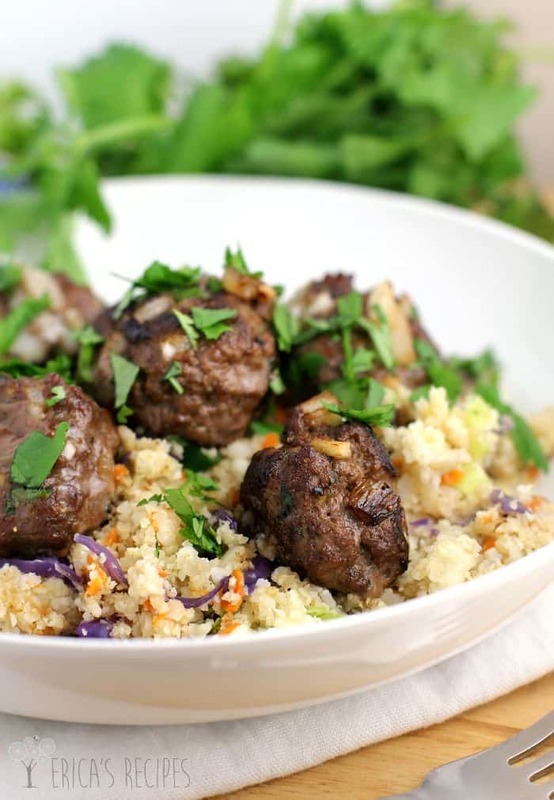 You’ve managed to combine health and flavor and throw in a good dose of beauty and convenience as well, with these meatballs. What is not to LOVE?! Love how nutrient dense, healthy and delicious this recipe is. It looks so tempting too! What a fun and healthy dish! I seriously can’t wait to try it! Beautiful post and photography as always Erica! This sounds incredible! I haven’t tried making cauliflower like this before. What a fantastic healthy dish!!! 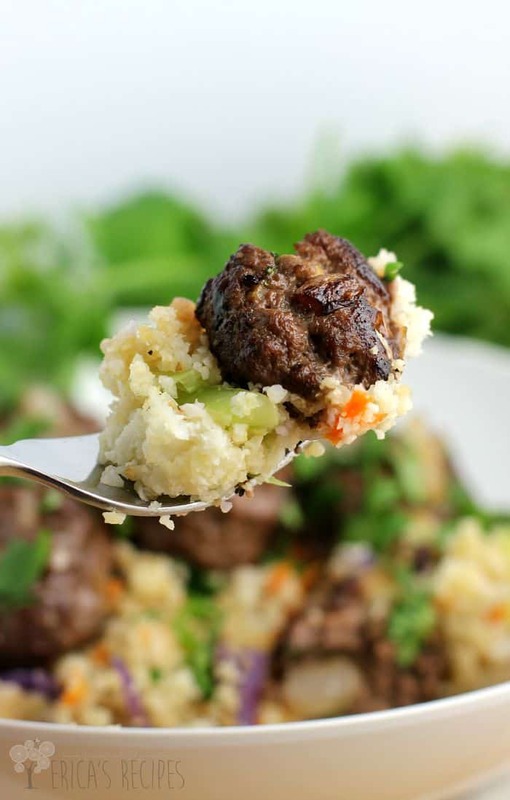 I have been dying to try the cauliflower rice, this looks like a great way to do it!! !